During the past twelve years, US-Turkey relations have been in a state of flux. Statements from Ankara and Washington D.C. to the Western media have been almost habitually optimistic, but the reality beneath the rhetoric has proven problematic for both nations. For the West, the rise to power of Turkish President Recep Erdoğan and his pro-Islamist Justice and Development Party has introduced complications in the previously stable US-Turkey relationship. Image by Govt. of Chile, wikimedia commons. As compared to earlier Turkish leaders, such as Abdullah Gül, the outspoken Erdoğan has demonstrated less finesse when dealing with Western leaders. In his three terms as Prime Minister and now as the President of Turkey, Erdoğan has represented himself as an agent for change. Precisely what sort of change Erdoğan represents is not so easy to identify. Erdoğan is a case study in contradictions. Turkey has been moving toward economic integration with the European Community for over a decade, and Erdoğan openly supports this. He’s counting on European markets to provide the cash that will satisfy the “development” aspect of his Justice and Development Party platform. Yet, in spite of his desperate need to bring Turkey into the European Community, he simultaneously sees himself as leading Turkey into a leadership position among Islamic nations. These two positions are not realistically or mutually sustainable. The values, standards, and laws that are central to European Community membership are not compatible with the values, standards, and laws of most Islamic nations. One of Erdoğan’s dilemmas is his relationship with Iran. Iran, unlike Turkey, is a Shia nation with a radical Shia theocracy. Therefore, it might seem a simple choice for Erdoğan to openly oppose Iran and Iranian ambitions in Syria and Iraq. However, Iran is Turkey’s second largest export customer. Iran also provides Turkey with about 35% of its oil supplies. Instead of being at odds, these two countries have fostered closer relations in recent years. The rise of a democratic reform movement in Syria followed by the birth of the ISIS cancer presents Turkey with obvious security risks. It also presents Turkey with a golden opportunity to assume a leadership role in the fight against ISIS at a time when Turkey so desperately wants membership in the European Community. In light of this golden opportunity, one might envision coalition air attacks being conducted from Turkish air bases, which are ideally located near the Syrian border. One might even expect the Turkish Air Force to take part in those raids. However, one would be quite mistaken. While Erdoğan has loudly demanded and received prompt NATO protection in the past, he refused to allow US and European air forces to conduct raids against ISIS from Turkish bases. For apparent diplomatic reasons, the US and its allies have downplayed their frustration with Turkey over this and several other issues concerning ISIS. Another contradiction in Turkish policies is Erdoğan’s changing relationship with the Kurds. While most Kurds see themselves as being one people in need of an independent homeland, Turkey views them as three distinct groups. The first group is the Kurds within Turkey. In order to enter the European Union, Turkey has been under pressure from Europe to improve its stance on human rights. Erdoğan and many Turks see the Kurds within Turkey as enemies of Turkish culture and a challenge to Turkish nationalism. In order to gain entry to the European Community, Turkey has changed some of the laws that discriminated against Kurdish Turks, but Turkey’s relationship with other Kurds remains more complex. The second group of Kurds resides to the east of Turkey in Iraq. From Erdoğan’s point of view, they are “our dear Kurdish friends to the east.” The central feature of those particular Kurds that makes them dear to Erdoğan is the oil reserves in their region. Perhaps I oversimplify. It’s not just the oil. There’s gas, as well. Image by Voice of America, public domain. The third group of Kurds is in Syria. Many of these Kurds previously resided in Turkey, but they escaped to Syria to avoid oppression by the Turkish government. While practicing to pretend to love Kurds in Iraq, Erdoğan is hosting 200,000 Syrian Kurdish refugees in Turkey. These Kurds have no oil and no gas to sell to Turkey, and so to Erdoğan, they are only a problem. 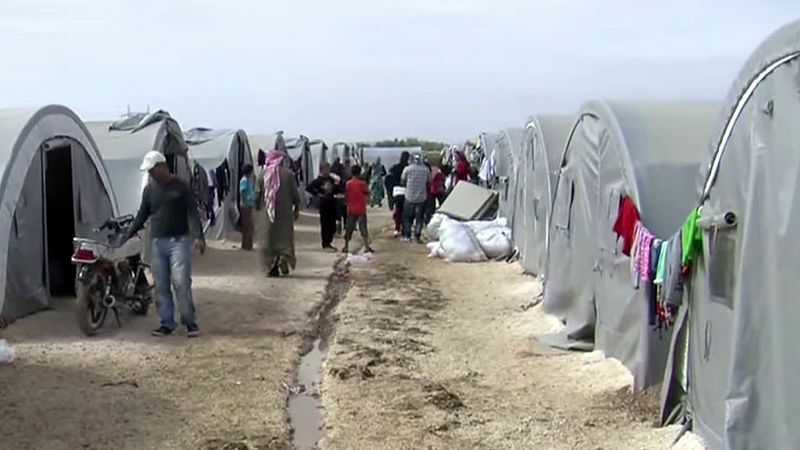 Removing ISIS from Syria would be a simple solution to the refugee problem. 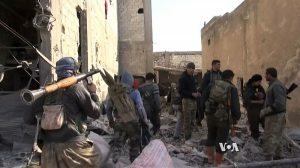 However, when ISIS attacked Kobani, Syria, on the Turkish-Syrian border, Turkey refused to allow the US and other coalition members to supply the Kurdish resistance fighters in Kobani through Turkey. In Erdoğan’s mind, Kurdish control of part of Syria represents a threat to Turkey. Erdoğan fears that the Kurds will one day do to Turkey what Turkey has done to the Kurds. The US grew tired of negotiating with Erdoğan and resorted to airdropping supplies to the Kurdish fighters. In spite of Erdoğan’s opposition to US assistance to the Kurds, the Kurdish resistance fighters were able to drive ISIS from Kobani. Kurdish YPG fighting in Kobani, Feb. 4, 2015. One particularly nasty rumor that surfaced during the battle of Kobani is that members of the Turkish army supplied ISIS with ammunition during the battle. Another serious allegation against Turkey is that it may have been supporting ISIS affiliated rebels in Libya. Turkey denies those allegations, but they cannot deny that a Turkish-born ISIS commander, Emrah Çaçan , is being treated in a Turkish hospital after being wounded in Kobani. At the same time, Turkey is prosecuting a Kurdish-Turkish medical student named Esra Yakar for providing volunteer medical treatment in Kobani. Esra left school to volunteer as a physician in Kobani. She was badly wounded there, and with the promise of better treatment, she was taken to a hospital in Turkey. Her Turkish doctor requested that she receive advanced care by eye specialists, but he was ignored. She then lost the use of her right eye. After she was finally transferred to a hospital in Ankara, Esra Yakar was ordered out of her hospital bed by police, arrested, and thrown in jail. Though she was released a few days later, she is still awaiting a trail date on April 30. Apparently, Erdoğan and his government consider anyone that gives medical treatment to Kurdish fighters to be criminals, yet they are happy to give medical care to a well-known terrorist. To be clear, not everyone in Turkey supports Erdoğan’s pro-ISIS behavior. The medical community in Turkey is outraged by what was done to Esra Yakar and has lodged complaints and petitions on her behalf. Unfortunately, the opposition in Turkey counts for less each day since Erdoğan’s government has stifled the press and used the police and intelligence services to crush any opposition to his rule. So why is Erdoğan so willing to defy his Western “allies”? Why would the European Community seriously consider Turkey’s application when Turkey has so clearly rejected all of the European Community’s shared values? In large measure, the answer is oil and gas. 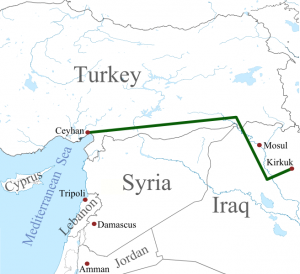 Turkey is serving as a major conduit for oil from Russia, Central Asia, and Iraq. Turkey must import most of the oil and gas that it consumes, and if the Justice and Development Party is to deliver on its “development” promises, it needs even more oil and gas to do so. 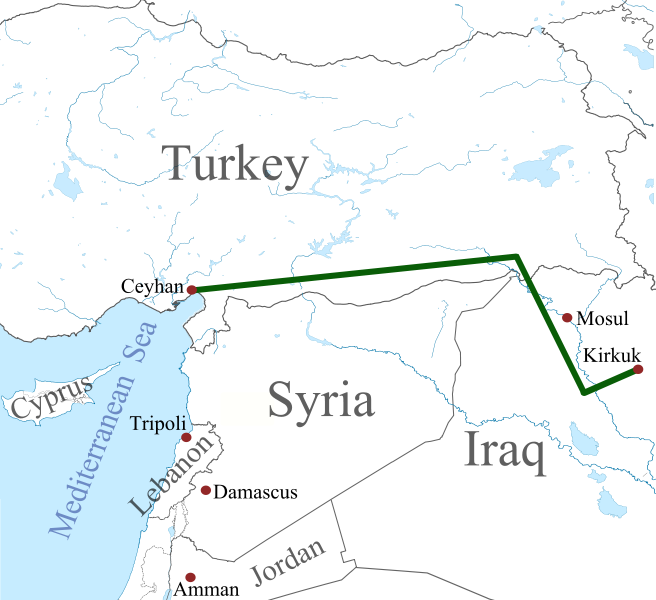 Kirkuk-Ceyhan Oil Pipeline–only one of many through Turkey. Image by Amirki, wikimedia commons. Although Turkey has none of its own gas and oil to sell to Europe, it collects lucrative fees on each barrel of oil or cubic yard of gas that flows through its pipelines or transfers through Turkish ports. At a time when Russia’s trans-Ukraine oil and gas pipelines are under threat because of its invasion of Eastern Ukraine, Europe will likely remain quiet about whatever Erdoğan does as long as he keeps allowing that oil and gas to keep flowing across Turkey. And what will the US do? For the moment, the US administration has decided to keep pretending that Erdoğan is an ally to the US and NATO. Elections in Turkey are scheduled to take place in June. Whether or not the throttled opposition can manage a victory remains to be seen. The US will not be interested in harming European allies by slowing the transit of oil and gas across Turkey to European markets. My guess is that, if Erdoğan and his party remain in power, the US will begin to disregard Turkish interests while continuing to pretend that Turkey is an ally. If the Justice and Development Party loses the next elections in Turkey, Turkey will likely end up with a more secular-leaning government, and it will abandon its fantasies of friendship with Iran and ISIS. Until that happens, we cannot expect any real improvement in US-Turkey relations. Homes, thanks. For someone like myself, trying to understand what goes on in the middle east, but who has a lot of learning to do about the sheer overwhelming number of different groups and their tangled webs of alliances and policy inconsistencies, they are a help. Best wishes. Hi Richard. Thanks for visiting. Hi Writegill. I’m glad that you liked it. Another well-argued analysis. Thank you.